FaxZero has been around for years (since 2006, according to Whois info) promising free faxing to anywhere in the US and Canada. So what’s the catch? Read on for an in-depth review of Fax Zero services, and what this company does and doesn’t offer. The catch isn’t really a catch – FaxZero is able to provide free faxes to the US and Canada thanks to advertising. This advertising appears in two forms: ads on the Fax Zero website, and a branded fax cover page that contains the company’s logo. So your free fax really is free, as long as you’re okay with the logo appearing at the top of your fax. Check out an example of what your cover page will look like here. We think this is a great deal. For most purposes, a logo at the top of the cover sheet isn’t a problem. How does free faxing work? All you need is a valid email address and a digital file to fax. 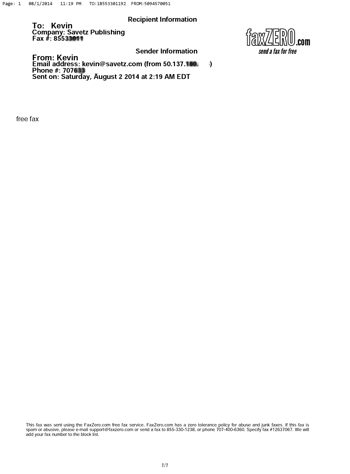 Fill out the fax form (see the screenshot below) with sender and receiver information. Attach your digital file or files (up to three files are accepted). Type whatever text you want to appear on the cover page, and format it if you’d like. The fax form provides a variety of basic formatting options, including bold, italic, underline, strike through, and various justification and heading options. Enter the confirmation code and select “Send free fax now”. You’ll need to check your email next. Open the email from FaxZero and click the link to complete the sending of your fax. FaxZero will send you a confirmation email when your fax has been delivered. If for some reason your fax doesn’t go through, Fax Zero will send you an email telling you that, as well. What if I want to send more than three pages? No problem! You just can’t do it for free. Fax Zero allows you to send up to 25 pages for $1.99, payable via PayPal. The $1.99 fee also removes the branding from the cover page, so this is the option to pick if you really need to send a fax without the FaxZero logo. What about faxing to countries other than the US and Canada? You can do that, too! Again, you just can’t do international faxing for free. Prices vary depending on which country you need to send a fax to, and Fax Zero provides a list of countries here. Click on any country to view the rate. We think this is a great deal, particularly for people who don’t need to send faxes often. If free branded faxes and the occasional paid $1.99 fax will accomplish what you need, why pay to own and maintain a fax machine? We love FaxZero!